This is the seventh in a series of articles on the Swami’s Surfing Association, which is celebrating its 50th anniversary this year. “Great!” Larry responded. “You get the surfers, I’ll get the blind folks.” That exchange started what is believed to be the first time a surf club had ever reached out to disabled people with an invitation to enjoy a challenge denied to them, up to that point, because of their disability. About a year later the event materialized. Larry, who at the time was volunteering at the Blind Community Center, tapped the local Lions club for help. The Lions agreed to bring tables, chairs and food and the SSA would do the rest. Later that year, after securing a permit from the state, the group assembled at Ponto Beach and was joined by the Solana Beach lifeguards who brought soft surfboards for the guests. The format for the event was that four surfers would form a team. One would be out at sea ready to launch the guest surfer. Two would be interim safety guards in case the guest fell off on their way to the sand. The fourth would catch them as they finished their ride. No one knew how this was going to work or if there was some unforeseen jeopardy that hadn’t been considered. 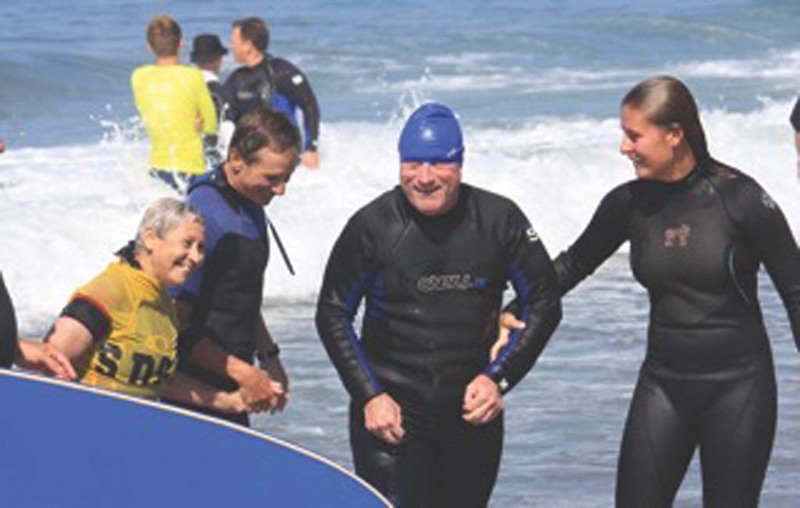 The blind surfers, after getting fitted out with wetsuits and boards, huddled on the beach. Many were nervous and unsure about the new adventure that awaited them in an environment that many of them had never even seen let alone experienced. The rest of the day was an emotional rollercoaster for everyone. Many of the guests rode wave after wave and wouldn’t get out of the water when instructed. Others gingerly tried a few waves and decided that was enough for a first attempt. As the day progressed, it was difficult to tell who was getting the most out of the partnership. It was obvious from the shrieks and laughter that the guests were having a ball. What was more striking, was that the surfers were deeply touched as they realized what a powerful impact they were having on the lives of people who typically couldn’t enjoy an experience that they took for granted. The event this year took place on September 14th at Ponto beach and as always, it changed many people’s ideas about what the blind can and cannot do. Next week, the last in the series: The next wave.